It is imperative that all exercise restrictions are strictly adhered to. These restrictions are designed to minimize the strain that your pet places on the surgery site and thereby decrease post surgical complications. Rehabilitation is also recommended to help your pet return to his/her normal self. “Rehab” promotes a more rapid return to normal function by maintaining normal range of motion in the joints, by maintaining or increasing muscle development, and by improving balance and co-ordination. The Rehab program outlined below has been developed specifically for your pets post surgical recovery period. While Rehab is not absolutely necessary in most cases it will speed up recovery and increase the likelihood of an excellent outcome. It is very important that owners contact the hospital if they have any concerns regarding the program or exercises outlined below. It is also extremely important that these exercises are performed in a manner that is not painful for your dog or dangerous for you to perform. Never force any therapy. If your pet seems excessively painful during any of the exercises please stop them and contact the hospital for further instructions. Passive Range of Motion (PROM): this activity involves moving all joints of the limb through a comfortable range of motion. This will promote cartilage and joint health, prevent contraction of the muscle and stimulate blood and lymphatic flow. If your pet is reluctant to cooperate, consider muzzling your pet to protect yourself and get the work done efficiently and safely. Have them lie on their side with the affected limb up. Gently and slowly extend and flex each joint (ankle, knee, and hip) 10 times, for 2-3 sessions daily. This should not be an unpleasant exercise and should only take 2 to 5 minutes. Short, slow, controlled short-leash walks are good. Start with 5-10 minute walks 2-3 times daily. After the above exercises are completed apply a cool compress to the hip (over the knee incision) 3-4 times per day for 5 to 10 minutes for the first 7 days. This will help decrease swelling and discomfort (a bag of frozen peas wrapped in a towel works well). Typically after the first week the vast majority of swelling has dissipated and cold compresses can be stopped (if excessive swelling is still noted 1 week post surgery please contact the hospital for further instructions) and moist heat therapy initiated. For heat therapy, a commercial heat product is advised. Moist heat has been shown to penetrate better than dry heat. A number of different moist heat products are available at most drug stores and typically contain gel, beads, rice etc. Another way to provide moist heat is to take a washcloth and wet it with warm water. Regardless of the product used it is imperative that it be warm to the touch but not so hot that it is painful when applied to your own wrist. If excessively hot it could result in a thermal burn. This therapy should be performed for 5 to 10 minutes prior to the above exercise sessions. 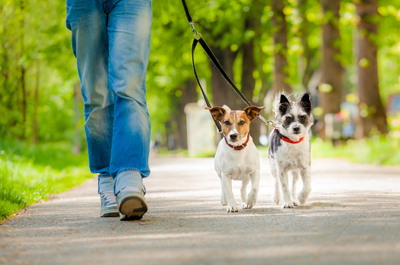 Increase walks to 10-15 minute walks 2-4 times daily. You are still keeping them slow, controlled and on a short-leash. Sit-Stand-Sit exercises. We call these puppy squats. The goal is to have your dog to sit down and immediately stand back up (small treats help tremendously- watch the calories if your dog is overweight). This promotes extension and flexion of all of the joints of the hind leg and also works all the muscles surrounding the knee. This should be performed 3 to 4 times daily and consist of 5 to 7 repetitions.